From 11:30 am to 1:00 pm, boarding time in the port of Zadar. If you arrive by your own car, you can proceed to the port already from 10:00 am and unload your luggage. Our service-team will show you the parking lot where you can leave your car. After embarkation, our representatives and guides will welcome you aboard with a drink and you will meet the crew and your fellow passengers. After a lunch snack “Cast off!”, heading towards Preko on the island of Ugljan. We hike to the highest point of the island, where we will find the fortress of Sveti Mihovil. From there we will enjoy a unique view of Zadar, all the way to the Velebit mountain range on one side, and of the islands of Iž and Dugi Otok on the other side. Dinner aboard and overnight stay at the port of Preko. For flight passengers arriving later with flights booked by I.D. Riva Tours, transfer to Preko and embarkation in the evening. Walking time: approx. 3:00 hours; ascent and descent, each 250 metres altitude difference. After breakfast, we will head towards the Kornati Islands National Park. According to the Irish author George Bernard Shaw (who received the Nobel Prize in Literature in 1925), “On the last day of creation, God crowned his work, and thus created, out of tears, stars and breath, the Kornati Islands”. The beautiful scenery, countless small and large islands (according to local lore “an island for every day of the year”), and the beautiful sea – all this makes the Kornati Islands a unique paradise. It is the largest and most dense archipelago in the Adriatic Sea – it comprises 147 islands, islets and reefs with a total area of 69 km 2 , spread over 230 km 2 . They cover an area of 35 km of length and 13 km of width among the islands of Dugi Otok in the north-west, Žirje in the southeast, and Pašman, Vrgada and Murter in the north and northeast. We head for the bay of Tarac on the island of Kornat, where we will start our today’s hike. Our destination is the highest point on the island, Mount Metlina (237 m). From there, we will enjoy a beautiful view on the island paradise, before returning down to the little church of “Our Lady of Tarac”. For overnight stay, we head for the Telašćica Nature Park, located in a deep bay in the south of the island of Dugi Otok. Walking time: approx. 4:00 hours; ascent and descent, each 273 metres altitude difference. 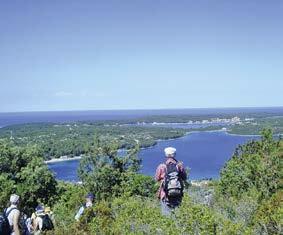 We will start our today’s hiking tour in the bay of Mir, in the Telašćica Nature Park. We walk slightly uphill to the cliffs, from where we will have a fantastic view on the Kornati Islands National Park, on the Nature Park Telašćica and on part of the Zadar archipelago. We continue along the rocky coast to the salt lake “Mir”. 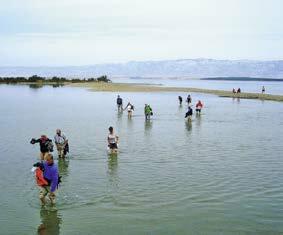 We will walk all around the lake, and then return to our ship, which will take us, passing the islands of Velika and Mala Lavdara, Rava and Iž to the island of Zverinac, where we will spend the night. Walking time: approx. 2:30 hours; ascent and descent, each 100 metres altitude difference. From Zverinac we will sail to the nearby Božava on the island of Dugi Otok. Today’s tour takes us from Božava first on the mountain Kapelica (135 m), from where we will have a spectacular view of the bay Saharun, the islands of Molat and Zverinac, and of the Veli Rat lighthouse. We continue along dry stone walls to the fishing village of Soline, through the village of Polje to Veli Rat, where our ship will be waiting for us. Afterwards we will set off for Starigrad-Paklenica, where we will spend the night. Walking time: approx. 3:00 hours; ascent and descent, each 134 metres altitude difference. Today we will cross the National Park of Paklenica. 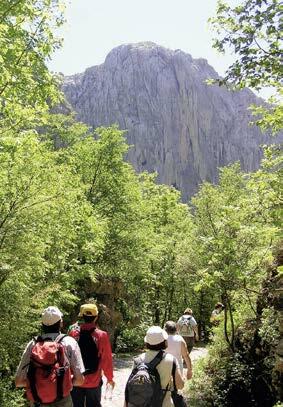 From Starigrad we will walk slightly uphill, through the Velika Paklenica Canyon, over the old trade route to the lodge. After a lunch break, we will head back, but first we will climb up to the Manita Peć cave. We will visit the cave, which is extraordinarily decorated with stalactites and stalagmites. We return to our ship, and then leave Starigrad-Paklenica to continue through the strait of Novsko Ždrilo and the Novigradsko More (the “Sea of Novigrad”, a lake-like bay) up the Zrmanja river to Obrovac. Overnight stay in Obrovac. Walking time: approx 6:00 hours; ascent and descent, each 560 metres altitude difference. A bus will take us from Obrovac to the village of Golubić, from where we will start our hiking tour through the landscape of karst and the canyon of the crystal clear Krupa River. On both sides up to 100 m high cliffs rise up from the canyon, while the singing birds and the croaking frogs accompany us. We will pass numerous rapids and gorgeous waterfalls. Afterwards we will be transferred by bus to the island of Vir, where we will meet our ship again. Overnight stay in Vir. Walking time: approx. 3:00 hours; ascent and descent, each 100 metres altitude difference. During breakfast, we will sail to Zaton, where today’s program begins. Through pine forests and across the streets, we will walk to the ancient Christian town of Nin, the former seat of Croatian bishops and kings, with antique excavations. Before returing to Zaton, we continue to the sandy beach of Sabunike and to a bay with healing mud. 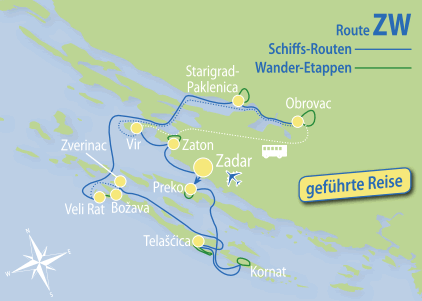 The last part of our cruise takes us from Zaton back to Zadar. On arrival at the port of Zadar, an experienced tour guide will take us on a guided walk through the historic old town, with its numerous sights and monuments. Walking time: approx. 4:00 hours; ascent and descent, each 50 metres altitude difference.